The two examples of solid support oligosaccharide synthesis employing thio-glycosides demonstrate the power of this strategy in the preparation of large carbohydrate structures. For the first time, a very large oligosaccharide was constructed via a block synthesis strategy in which every block itself was prepared on a solid support. The synthesis of combinatorial carbohydrate libraries using this strategy should certainly be possible. Fraser-Reid and coworkers have established «-pentenyl glycosides as a class of powerful and versatile glycosyl donors . Activation by a variety of reagents [e.g., N-iodosuccinimide (NIS), TESOTf] furnished various glycosidic linkages in high yield and excellent selectivity in solution phase synthesis. More recently, the application of «-pentenyl glycosides to the synthesis of oligosaccharides on a solid support has been explored . Both donor- and acceptor-bound synthetic strategies were investigated initially. Attachment of a pentenyl glycoside through the C6 hydroxyl group to the solid support was achieved via a photolabile 3-amino-3-(2-nitrophenyl)propionyl linker. Glycosylation using NIS and TESOTf as activating agents did not result in clean formation of the desired disaccharide product but also yielded lactol by donor degradation. An acceptor-bound synthetic strategy was more successful. Model studies with a glucose acceptor that was anchored to the solid support via its anomeric position showed that a- and ^-glucosidic and C2 amino glucosidic linkages could be furnished in average coupling yields of greater than 90%. Reaction development was aided by 13C gel phase NMR spectroscopy to analyze the formed products . After these initial studies, the synthesis of a support-bound, fully deprotected trisaccharide was achieved (Scheme 14). Chiron's polystyrene-grafted "crowns" were chosen as solid support material because they are more amendable to parallel synthesis than traditional polymer supports. A photolabile o-nitrobenzyl linker was selected to attach the first amino glucoside 83 through its anomeric position to the solid support. Removal of the C6 dinitrobenzyl protecting group was followed by coupling with pentenyl mannoside 84 and resulted in formation of the desired di-saccharide 85. Removal of the C2 chloroacetyl protecting group and coupling of pentenyl galactose donor 86 furnished trisaccharide 87. Global deprotection followed by peracetylation and photolytic cleavage from the solid support provided trisaccha-ride 88, but no yield was reported . 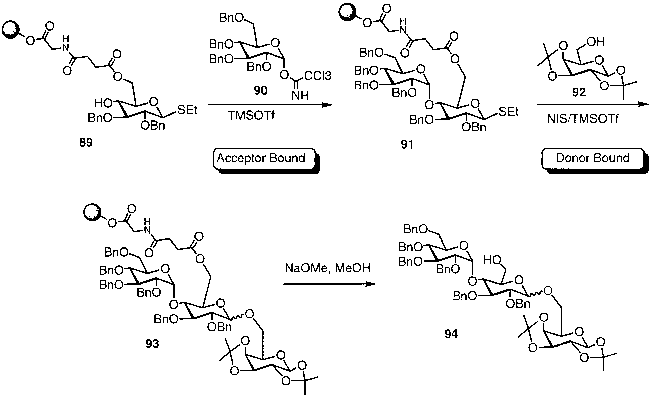 The preceding sections discussed the strengths and weaknesses of the donor- and acceptor-bound synthetic strategies developed to date for the synthesis of complex oligosaccharides. Boons et al. recently described an approach that combines both strategies in a bidirectional solid phase oligosaccharide synthesis . Scheme 14 Application of ra-pentenyl glycosides to solid phase synthesis: preparation of a trisaccharide. Scheme 15 Bidirectional strategy for the synthesis of oligosaccharide libraries. 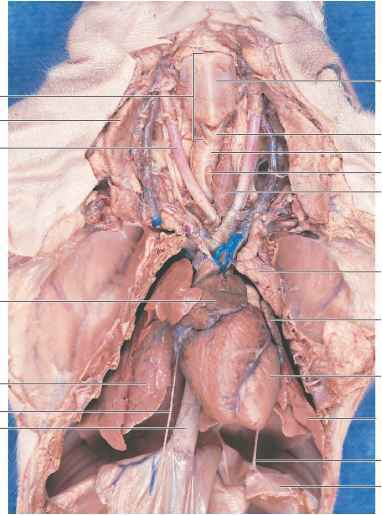 linker. First, the exposed C4 hydroxyl functionality of 89 served as glycosyl acceptor in the reaction with solution-based trichloroacetimidate donor 90 in the presence of TMSOTf as promoter. Without the need for further protecting group manipulations, support-bound disaccharide thioglycoside 91 was activated with NIS/TMSOTf  to serve as a glycosyl donor in the reaction with solution-based glycosyl acceptor 92. This strategy served to generate a combinatorial library of trisaccharides while minimizing the necessary protecting group manipulations. This bidirectional approach stands to combine the advantages of the acceptor-bound approach, such as use of excess donor during the synthesis, with the opportunity to fashion glycoconjugates through the anomeric position formerly possible only in a donor-bound paradigm. 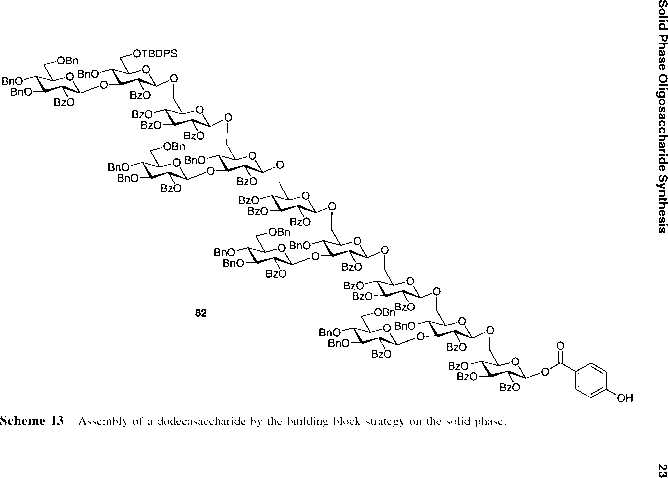 Other combinations of orthogonal glycosylating agents and the applicability of this strategy to the synthesis of larger oligosaccharide structures will have to be addressed in future studies.